On 30th April 2017, Colin Skeath and his nephew Davis Gould-Duff set off from Loch Sunart on the West Coast of Scotland in an open canoe, aiming to circumnavigate Britain. Colin and Davis had already had many adventures together since Colin introduced Davis to the great outdoors when he was no more than a toddler. Their most notable joint climbing venture was an epic nine-day ascent of Muir Wall on El Capitan in 2010. Climbing and mountaineering has taken Colin all over the UK, as well as to Europe, Africa and America. Colin has had three trips to Yosemite National Park where he has climbed multi-day “big walls” including The Nose and Muir Wall on the valley’s spectacular El Capitan. Colin’s passion for the vertical started to give way to canoeing in 2010 when he bought a 17 foot canoe and learned the basics of paddling on Loch Sunart, and by 2012 climbing was a thing of the past for Colin. Following many adventures by canoe around the West Coast of Scotland, in June 2015 Colin and his wife Katrina made an adventurous circumnavigation of Anglesey in North Wales by open canoe. This involved paddling through dangerous tide races and through the turbulent Menai Straits in the dark. In 2015, in preparation for their planned Canoe Around Britain, Colin and Davis made the first circumnavigation of the Isle of Skye by open canoe. 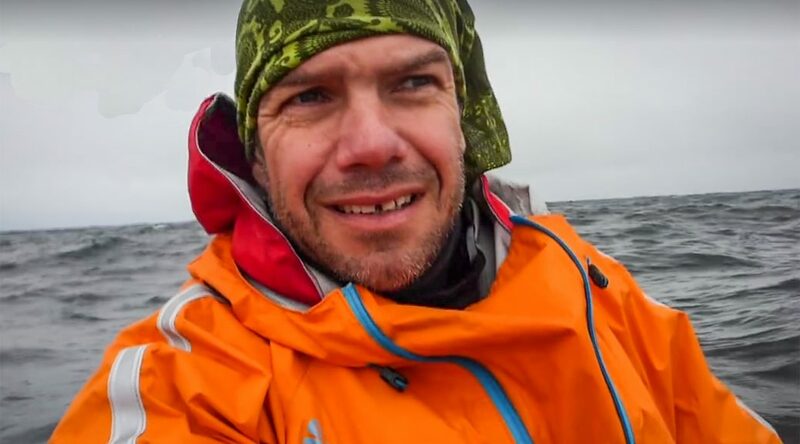 Their efficient use of paddle sailing was evident as the pair completed the adventure in five days. A year later they completed a 174 mile canoe trip across the highlands of Scotland. They paddled the River Spey, the coast from Spey Bay to Inverness and the Caledonian Canal in just three days. 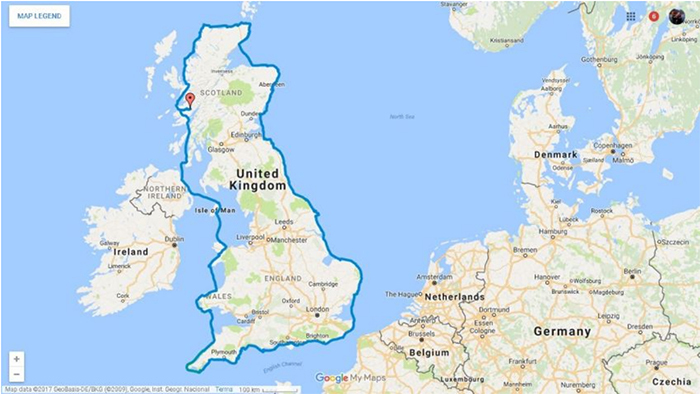 The route (clockwise) that Colin and Davis took to circumnavigate Britain by open canoe. Image courtesy of Colin Skeath. I’m delighted to have Colin join me for this podcast to discuss this epic adventure, where the idea came from, the mindset required of them and what they learned from the experience. 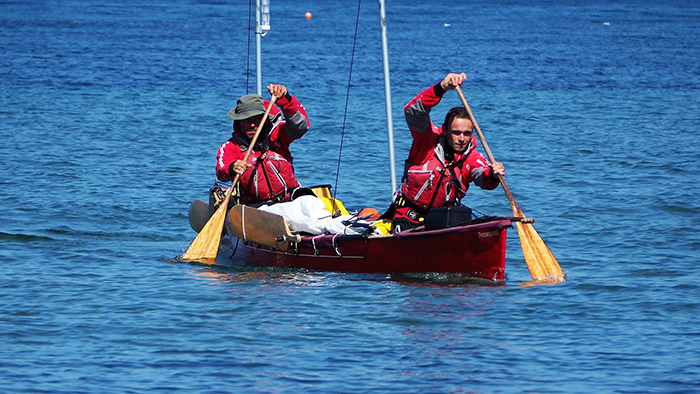 Colin and Davis during their Canoe Around Britain circumnavigation. Photo courtesy of Colin Skeath. Approaching Lands End. Photo courtesy of Colin Skeath. The moment Colin and Davis completed their epic journey is captured in the video below…. Nice one Darren. Glad you liked it. Imagine my delight in not only having my questions answered but also getting so much I side thought on this epic journey. Thanks to both of you for putting this together chaps it was a real treat! Hi Paul! As always a great podcast-this chapter is among the best! 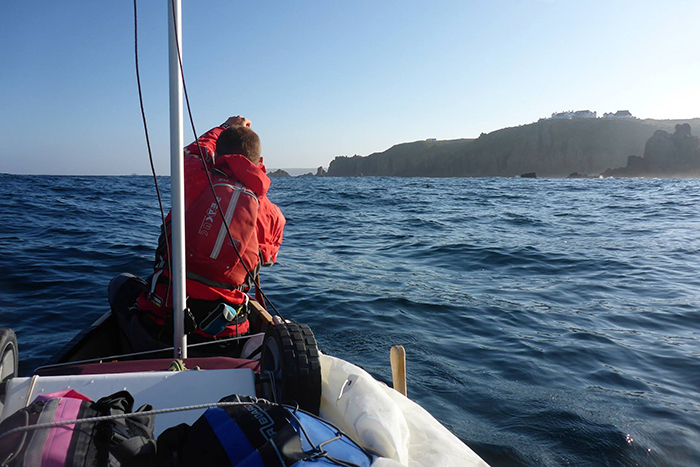 I love sea adventures…..the rugged individual stretching the boundaries of outdoor experience. Great detail….kudos to Colin and Davis! The world awaits! This maritmime podcast ranks with the Aleutian adventure in your early podcasts Paul. Never turn your back on the sea! I met Colin and Davis on their trip down the East coast and what an interesting couple of blokes! Great to hear what Colin was saying after the trip as they were not even half way round when I met them. He is coming down to do a talk in March so looking forward to seeing him again. Thanks for your comments Ollie. Glad you liked the podcast. Enjoy the talk in March. A great achievement in a great podcast as always Paul. I am just about to listen to all your podcasts from day 1. Hi Jonathan. Thanks for your comments here and I’m glad you found this as a starting point. I hope you enjoy and are further inspired by all the other episodes.